Hood River, Ore. – “Ten years ago Full Sail introduced Session Lager, and it reflected our view that beers should be inclusive and celebrate camaraderie without extremes or gimmicks. 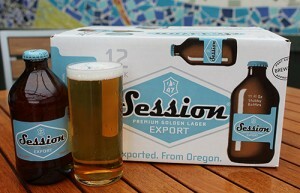 Grateful that many beer lovers agree with us, and with “sessionable” beers suddenly all the rage, there’s never been a better time to expand Session’s universal appeal. Our new Session Series gives Session fans three additional ways to enjoy “Session-ability” as their tastes (and the weather) changes,” said Irene Firmat, Full Sail Brewing Company’s CEO & Founder. Founded in 1987, the independent and employee-owned Full Sail Brewery is perched on a bluff in Hood River, Oregon, overlooking the most epic wind and kite surfing spot in the world. Over the last 27 years, Full Sail has collected more than 300 national and international awards for their beers and sustainable practices, including 150 Gold medals and was recently named Craft Brewer of the Year by Beverage World Magazine for their years of “sustainable stewardship, quality, consistency and operational ingenuity. Among the company’s most popular brews are Full Sail Amber, IPA, Pilsner, Pub Series, Session, Session Black, and Session Series beers. At this very moment their specialists in the liquid refreshment arts are crafting barley and hops into your next beer. The Full Sail Brew Pub is open seven days a week. Swing by for a pint, grab a bite, tour the brewery, or just soak up the view.